Balloons are the best way to decorate any party event colorfully. Whether it is a birthday party, wedding event, anniversary event, or any other celebration, decorating your venue using party balloons make your area look impressive and more beautiful. Children also love to see colorful balloons. If it is your kids’ birthday party, you mustn’t forget decorating the event with stylish balloons to give a wonderful surprise to your loving kid. No wonder how the shape and size of the balloon are, having balloons for party decoration is one of the best ideas. If you are decorating your party event yourself and buying balloons in bulk, then you may end up getting more of broken balloons in the pack. So, it is advised to buy some extra packs so that you can decorate your party area without any compromise. Try to look closer at the area where you will use balloons for decorations. Come up with an estimation of how many balloons you would need to decorate your event. Some people give return gifts to the kids and hang colorful balloons over the return gifts. If you have such plans, buy the number of balloons accordingly. There are different types of balloons available in the market these days. Create an approximate balloon budget and use balloons that easily fit your wallet size. There are latex balloons, aluminum balloons, Helium-filled balloons, air-filled balloons, water-filled balloons, and many more. You can choose the best balloons according to your budget. Once you are done with the above-said tips, inflate balloons and handle them with care. There are times when you have to bring the inflated balloons from the seller to the party area. You must make sure that the inflated balloons are well-packed to reach the venue safely. When you are decorating and organizing balloons into different shapes and sizes, do not forget to create shapes that do not harm one or the other balloons. Every balloon should be carefully fixed so that it doesn’t affect the other balloons. When making shapes from the balloon, every balloon has its meaning so bursting of one balloon may affect the entire balloon shape. The balloons are of different shapes, sizes, and colors. They are flexible enough to get any shape you want. You must handle the care and inflate them according to shape or the size you want to create. If you are making an arc for the entrance area, you can go for two colors of the balloons may be pink and white and come up with an impressive balloon arc. 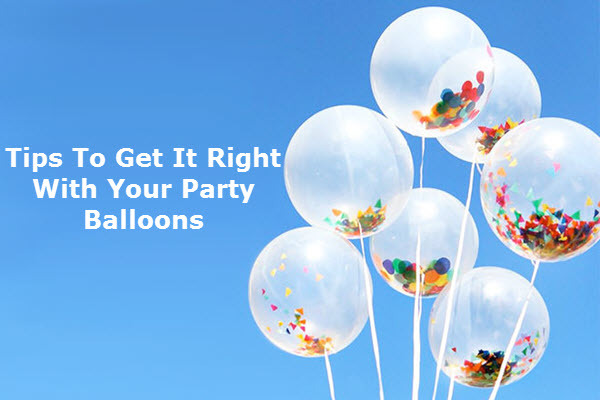 Above are some of the best ways to get it right with your party balloons. Hopefully, you will find this information useful and consider these tips to make the best use of balloons.